The Ducks relied on Ryan Getzlaf to score early on this season with Scott Niedermayer and Teemu Selanne pondering retirement. Anaheim Ducks forward Ryan Getzlaf has experienced more success in the past 12 months or so then some NHL players do during their entire careers. In January 2007, the power forward shined at the YoungStars Game in Dallas, scoring twice for the Western squad. 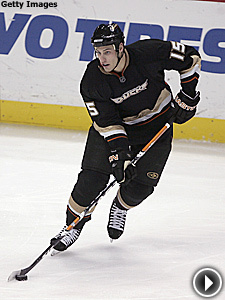 Five months later, at the age of 22, Getzlaf won his first Stanley Cup in a 4-1 series win against the Ottawa Senators. With seven goals and 10 assists, Getzlaf led the Ducks in postseason scoring. This past November, Getzlaf's play earned him some security, as he signed a five-year extension with Anaheim. Two months later, with 19 goals, 58 points and a team-leading plus-24 rating already under his belt in 2007-08, he found himself in Atlanta as a Western Conference All-Star. Today, Getzlaf's 21 goals and 51 assists lead the Ducks, who are aggressively seeking a chance to defend their Stanley Cup title. "It's been great," the former first-round pick said in an exclusive interview with NHL.com. "With all that's gone on, the extension and everything, the fact that I'm going to be in Anaheim a long time, it's a great thing for me. I'm excited. I have sat back a little bit in the last little while and kind of embraced all the experiences that I went through." Getzlaf attributed a lot of his early career success to the players he's been surrounded with. No question, it can only help to play alongside Scott Niedermayer, Chris Pronger, and, most recently, Doug Weight. Getzlaf knows he can only learn from such seasoned veterans. "I've only been in this League a few years, so I really feel blessed and fortunate to have this chance," Getzlaf said. "You learn not to take anything for granted. There was some pressure entering the League as a first-round pick, but when you're given the opportunity to play with such great players, it makes it a little easier. When I arrived, the players here welcomed me with open arms and that's something that made my transition a lot easier." The transition from winning the Stanley Cup in 2007 to this season wasn't so easy for Getzlaf and his teammates. The Ducks were forced to start the season without Niedermayer, who contemplated retirement until finally returning in December. Teemu Selanne, a vital part of the team's success last season, is in the same boat. Anaheim struggled early, but has been on cruise control since Niedermayer's return. The Ducks sit in the fifth seed in the West with a 39-25-7 record. Getzlaf admitted the locker room just wasn't the same without Niedermayer, the 2007 Conn Smythe Trophy winner as the postseason's Most Valuable Player. "I don't know if it's so much a boost as it is a comfort level," Getzlaf said. "It was like he belonged in the dressing room. When he came back, it just kind of settled everybody down. It enabled us to kind of jel together. With Doug Weight coming too, it was a big move for us. He brings a lot of that veteran presence, as well." While Niedermayer was undecided and Dustin Penner gone to Edmonton, Getzlaf -- along with the now injured Corey Perry -- were relied upon heavily to produce offensively. Niedermayer, who watched his team from his couch until deciding to return, was confident the duo could carry the load. "I think him and Corey both have been put into a position this year where they're the No. 1 guys offensively," Niedermayer said. "They've done a great job with it. They've picked up right where they left off and just continue to get better. It's great to see them at an event like this, because they belong here." But with Perry sidelined by a muscle tear for the rest of the regular season, and perhaps into the playoffs, the onus is on Getzlaf to carry on. But on a veteran-laden team, he will have help. Niedermayer arrived in Anaheim with three Stanley Cup championships already under his belt as a member of the New Jersey Devils. But other players, like Selanne and Pronger, hadn't won until Anaheim knocked off the Senators last June. While Getzlaf was fortunate to win a title at such a young age, he was more thankful to see his veteran teammates finally get the taste of a championship. "It was cool," Getzlaf said. "The biggest part about it was seeing all the guys -- like the Selanne's, those kind of guys -- who hadn't won it their whole career. You see how hard they've worked to get there. I was fortunate enough and blessed to be able to get there in my second year." Now in his third season, it appears Getzlaf has a solid chance at making a run at a second championship. Combine that with his emergence as a top power forward and it's safe to say things really couldn't be going much better for him.